Smaller than a mouse pad is the best way to explain this great polisher. 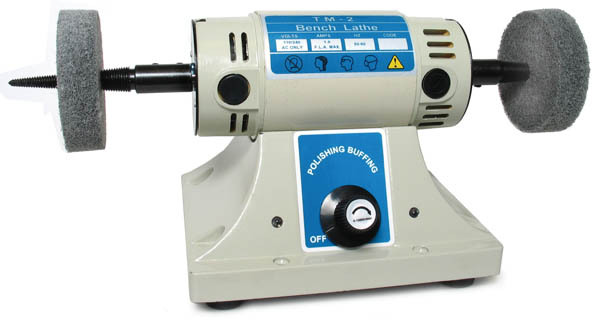 This small Bench Polisher has pre-lubricated ball bearings and a dust-proof motor housing that makes it virtually maintenance-free! You will not sacrifice quality or speed with this well balanced precision polisher. Works with standard wheels and buffs up to 4". Includes 2 tapered spindles, 2 medium abrasive wheels, 2 replacement motor brushes and screws for bench mounting. Variable speed from 1,800 - 7,500 RPM. Ground Shipping Only. Cannot be shipped via air. Additional shipping charge applies.